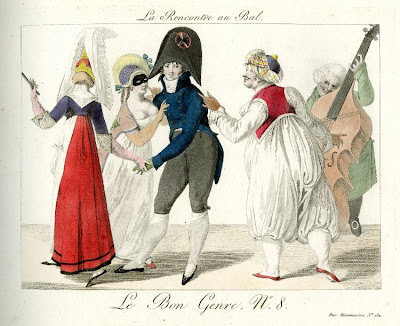 Originally published in 1817, Le Bon Genre is a series of prints depicting the lives and rise of the Parisian middle-class, giving us an invaluable insight into their customs, fashions and pastimes, in Post-Revolutionary France. 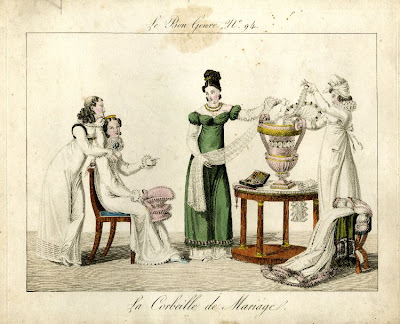 And of course, given the rivalry that has always existed between France and England, there are also plates ridiculing the English mores and fashions! Millia Davcenport, in her The Book Of Costume, II, gives us more details about this work: “The Bon Genre’s first edition, 104 plates, appeared in 1817. 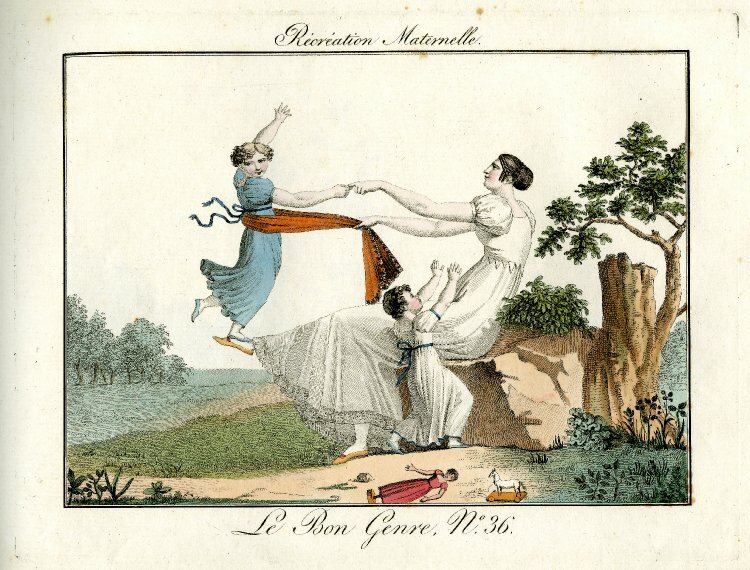 The 1822 edition included eleven additional plates; a third edition was published in 1827. 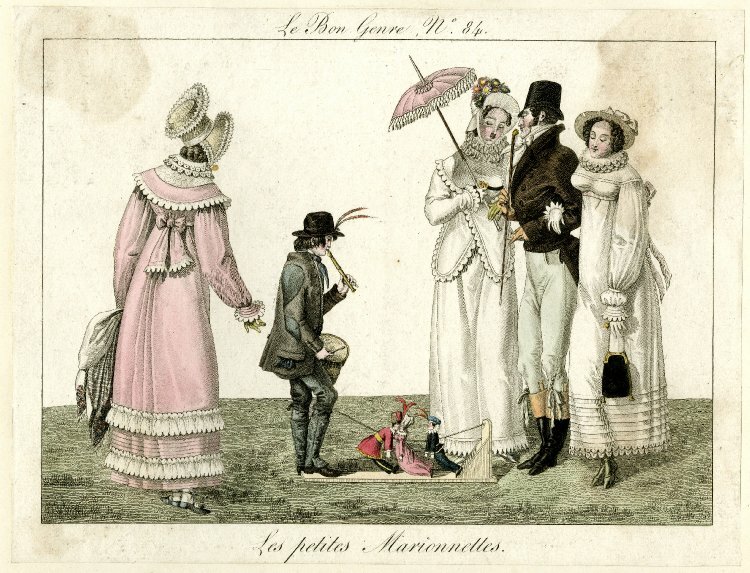 Its illustrations are lively and witty statements of the life of Paris since the beginning of XIXc., with a text of explanatory paragraphs, rather than fashion plates”. Here are a few of the plates. Click on them to enlarge them. Plate 4. Three women are eating ice cream. A water is bringing them a menu.I wonder what flavours they chose? Plate 5. Two, not very attractive, women are dressed by their beautiful maids. The couples are separated by a mirror. 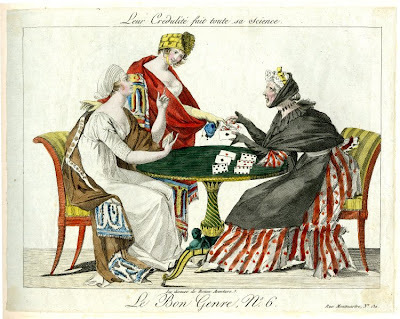 Plate 6: an old woman is using a pack of cards to predict the future of the two women in front of her. Plate 8. A masquered ball. A young woman wearing a mask is dancing with a man when she is greeted by a gentleman dressed as a Turk. Plate 19. two women and a man are executing “La Trénis” figure of the Contredanse, while another man, who finds it too complicated, watches. 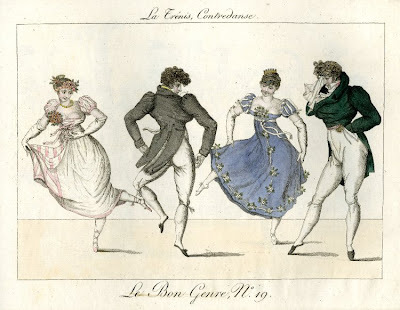 Looks like a lively and fun dance, doesn’t it? 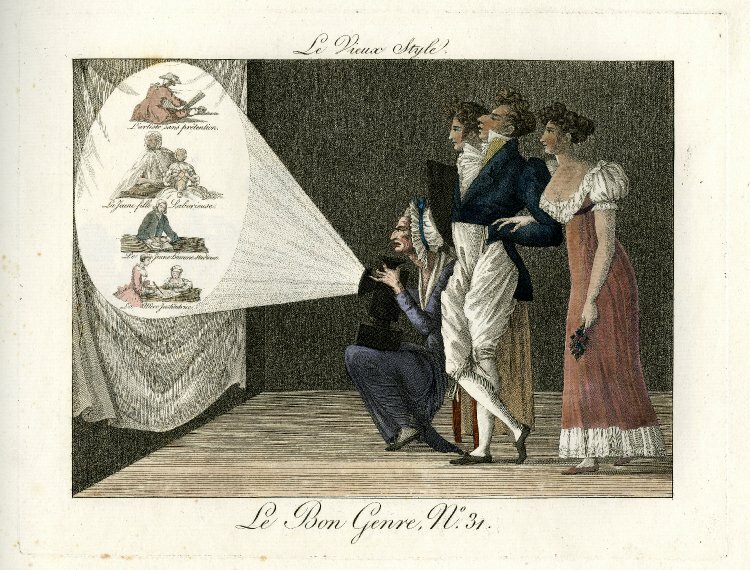 Plate 31. an old woman is showing a lantern projection of four scenes of a virtuous and laborous life to two fashionable ladies and a young gentlemen, who don’t seem to appreciate them much. 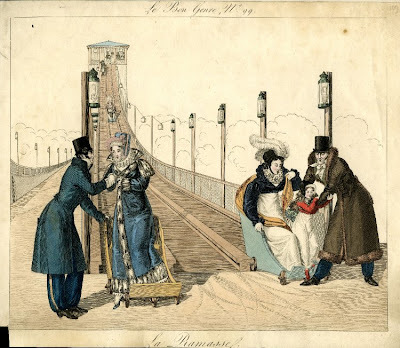 Plate 36. A mother is playing with her children at the park. Lovely, isn’t it? 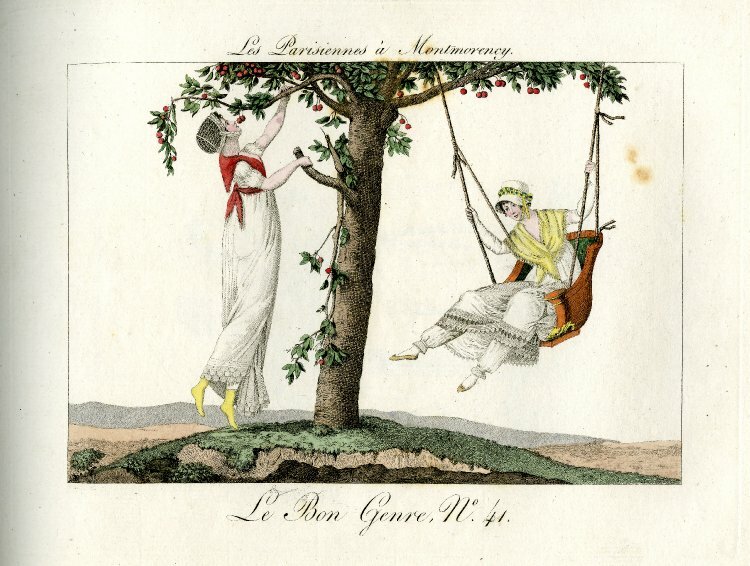 Plate 41: Two Parisian women having fun at Montmorency. One is picking cherries, while the other is swinging in a basket. Plate 64. As many women know, one must suffer to be beautiful. 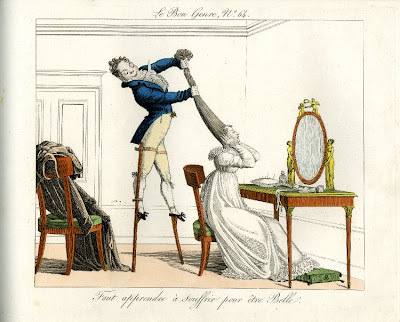 And the lady in this plate is definitely suffering while her hairdresser, who is standing on stilts to reach the top her hairdo, is arranging her hair. 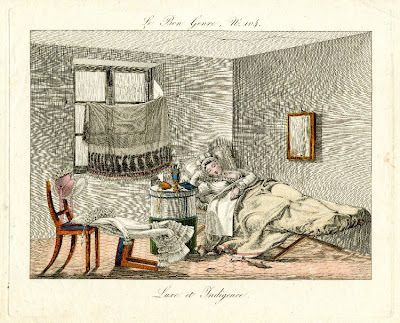 Plate 76. An old woman is trying on a hat in a milliner’s shop. She’ assisted by three girls. Judging by the look on their faces, she mustn’t be an easy customer! 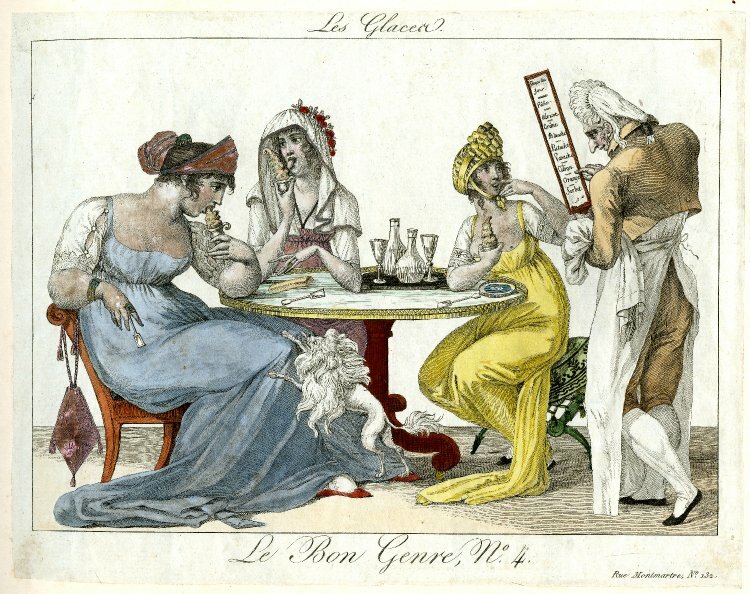 Plate 84. A man and three women watch a young street entertainer playing pipe and tabor while making three marionettes dance by a string attached to his knee. Plate 94. Two women pull out of a giant amphora the presents by the bride for the groom. Although, I think she’s gonna enjoy them herself a lot more. Plate 96. 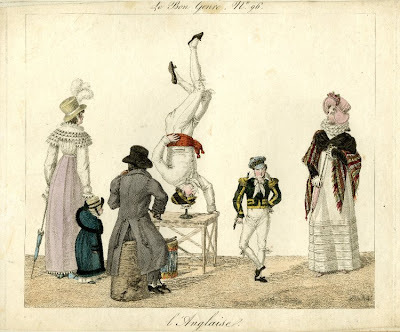 A boy dances a gig, an acrobat stands on his head on a table and a man, sitting on a tree stump, fiddles, while spectators look on. The plate shows the similarities, and the differences, of Parisian and London fashions. 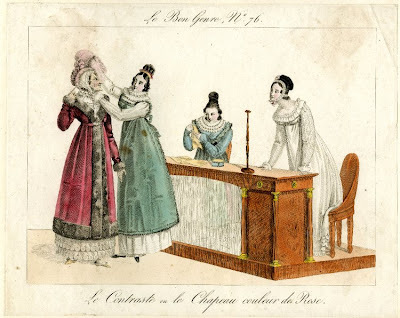 The woman on the right, wearing a white dress and a dark spencer over which she’s wrapped a striped shawl, is English. 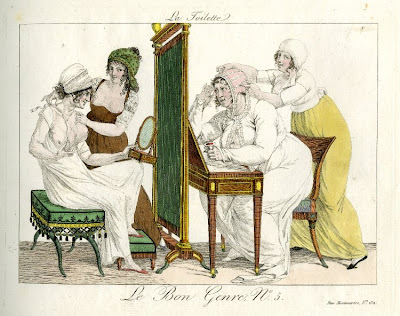 Her nationality is given away by her bonnet, which is decorated with roses instead of the long feathers preferred by Parisian women. Plate 99. A man helps his wife and daughter get off a cart as they reached the bottom of a helter-skelter. Judging from the lamp posts on both side, you could probably ride it at night too. Plate 104. 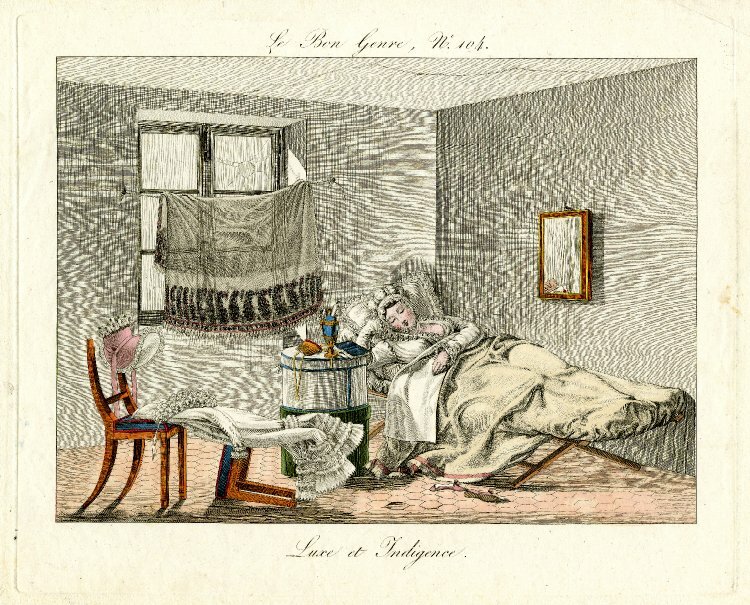 A young woman is sleeping in a bed in her garret. She’s spent the night at a party, as we can infer from her luxurious ball gown now resting over a chair. She must have come home late as she’s still asleep despite the sunlight streaming in, announcing the morning has arrived.